Easter is always a fun family time here at Cowslip and this Easter Saturday we have lot's going on. Julia Terry is here teaching her needlefelted Easter bunny workshops and we are having an Obstacle Egg & Spoon Race in the field (Steve and Chris are busy building the course!) after lunch at 2.30 for under 5's, under 8's and under 12 year olds with a prize for the best dressed Easter Bunny, everyone will get a small egg (chocolate of course!) and a rosette, £2.50 entry. 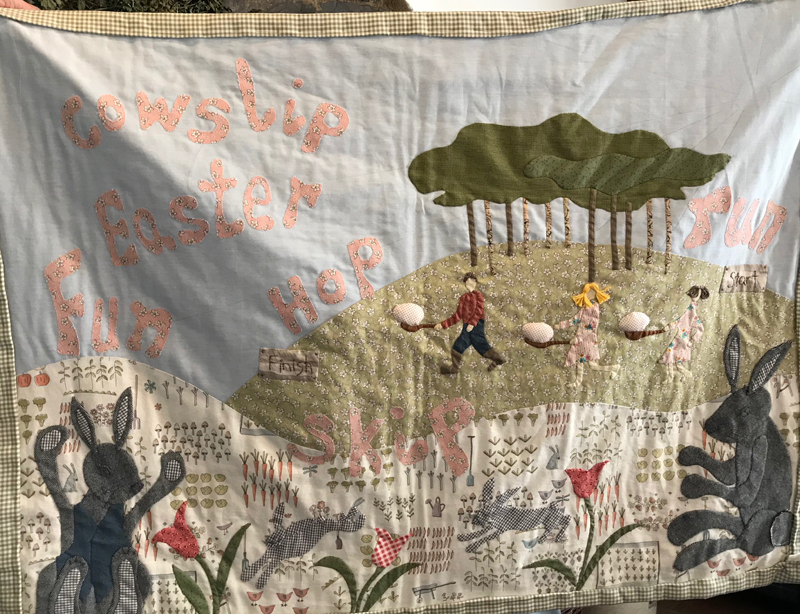 A group of local Artists and Makers, Gwynngala, are having their second exhibition in the barn alongside 'Mad on Daisies' themed quilts made by Cowslip students, which will be running from 19th - 28th April. Nicola Rowles is in the cafe with her latest exhibition "Wild about Art". Come and meet the artists between 12 and 2pm on Easter Saturday with wine and nibbles, everyone is welcome.